If you’re wandering Aix looking for a morning cuppa or a sweet indulgence, search no further. Opened by MOF (Meilleur Ouvrier de France) Philippe Segond, Riederer is the must try pâtisserie in town. Here in Aix, every day is like Christmas when you can gaze into the beautiful window display of Riederer, longing for a morsel of a beautiful entremet. There are so many ornately decorated little cakes to choose from. Lucky to have friends and family to share with, we ordered a couple to partager, in addition to our sorbet and café. My favorite was the trianon which contained praliné, dacquoise et mousse chocolat. There was another one similar in appearance, whose name escapes me at the moment, but it had a layer of chocolate ice cream. I’d say it was equally delicious and recommendable. We didn’t eat the entire store. 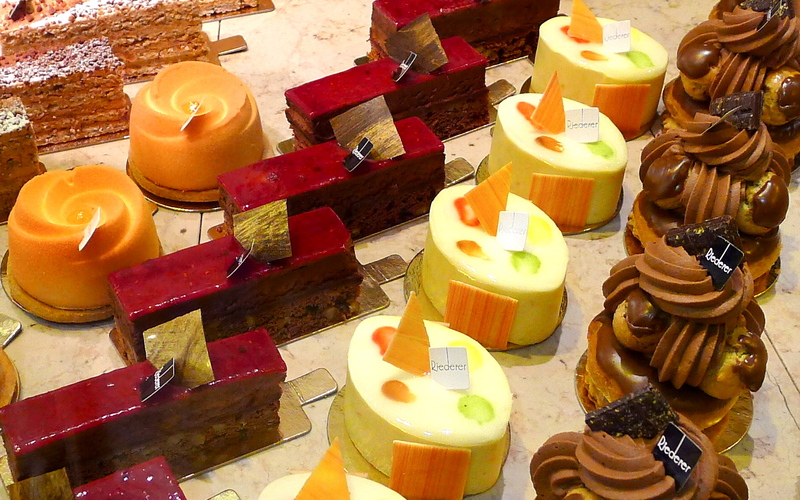 Riederer has a gazillion things we didn’t try like macarons, calissons, chocolats et plus. Go and see for yourself! This entry was tagged Aix en Provence, entremet, France, MOF, olala, pâtisserie, Riederer, sorbet. Bookmark the permalink. Aix – en – Provence – visited once when in high school and again two years ago….a very lively and warm place because of the college student vibe. But I missed that pastry store…ah, next time.